Overseas I’coo has introduced a practical gear set that grows with your family and cuts down on the amount of clutter you will have in your house. 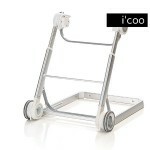 The Grow with me 1-2-3 features a ultralightweight aluminium frame that is modular. Depending upon your child’s needs, parents can choose between bed, rocker and highchair. A telescopic height adjustment makes sure it’s always at the right position for your child and a convenient fold ensures that it can travel easily or can be stored efficiently when your child is done with it. As a cuddly bed the grow with me offers the highest comfort for the first months of your baby´s life. 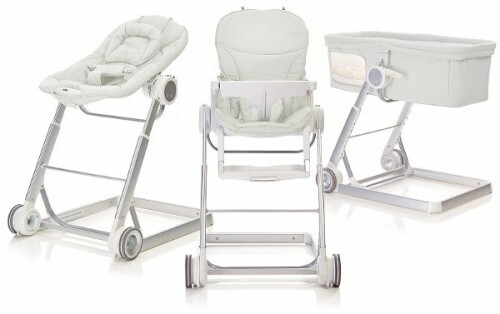 The large rocker has a 3 position adjustment, comes with mp3 connection and automatic vibration to keep your little one comfortable and relaxed. 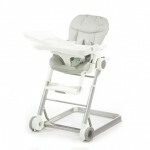 The highchair option provides baby with a 5-point safety belt and the ergonomically shaped footrest. Moreover, the Grow with me 1-2-3 offers a large food and play tray which is detachable and washable. I live in Burbank CA USA and I would like to get this for my amazing wife. Does anyone sell this in that states or is there a way I can get this? Thank you to anyone who can help.